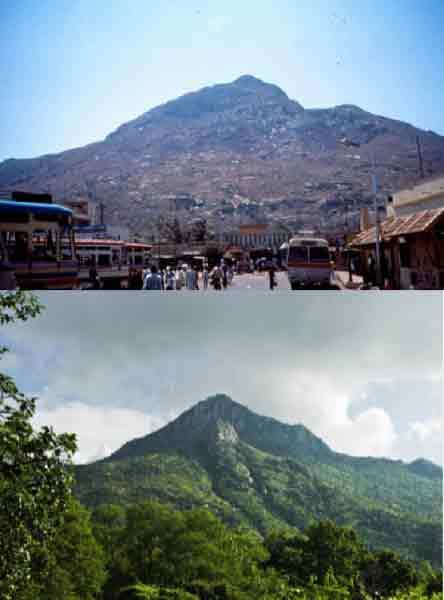 Reforestation of the Sacred Mountain of Arunachala, in South India, has been resoundingly successful. John Barrie Button explains his permacultural approach to the challenge. 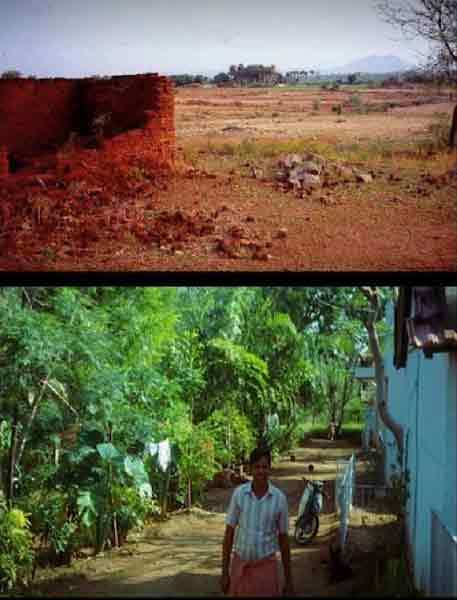 In 1989 I was asked to co-ordinate a reforestation project in South India. 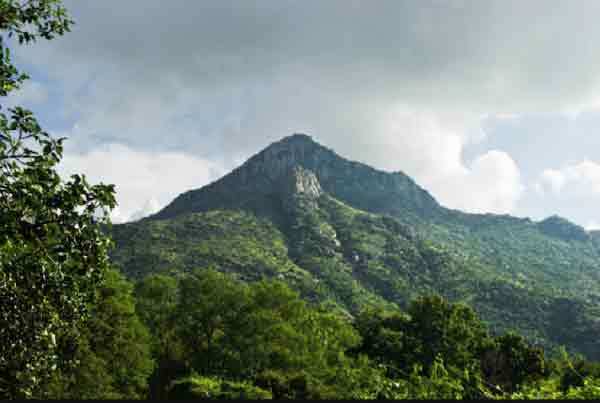 Specifically, this was a sacred mountain, Arunachala, recognized as Siva in the form of Light, or Fire. 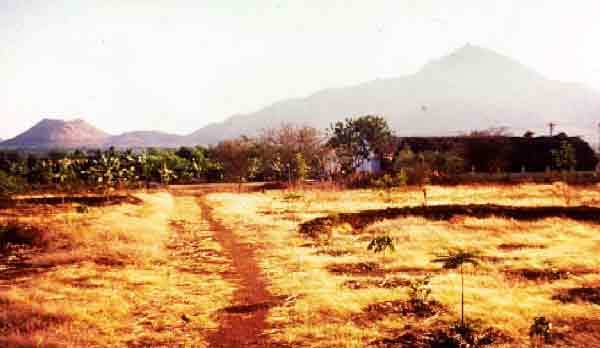 The view of the mountain from the bus station, when I first arrived in 1989 – rocks and almost no vegetation at all. Mountain was burnt every year, to evenly raze all the grass stubble and provide some potash as fertilizer for the grass cut for thatching material. Minimal income for a few dozen workers. As the legend relates, Shiva, Lord of Destruction and Re-creation, was asked to adjudicate an argument between Vishnu (Lord of Preservation) and Brahma, Lord of Creation as to who had precedence. Having manifest Himself as a column of the pure light of consciousness, he bade each of them to find His limits; one to seek the lowest point, and the other the highest. Neither apparently was successful, and in their awe of Shiva’s brilliance, they pleaded with Him to take a form less dazzling, which mere mortals could then behold. 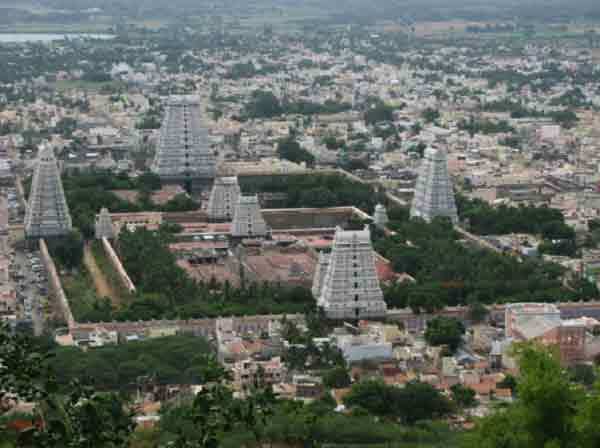 Shiva agreed, and transformed himself into the form of the mountain, Arunachala, which has been venerated ever since. The main temple from the mountain. We approached the temple to use the temple for our nursery, raising 400,000 seedlings per year, providing flowers and coconuts for daily worship, and initiating the creation of the largest temple garden in India. 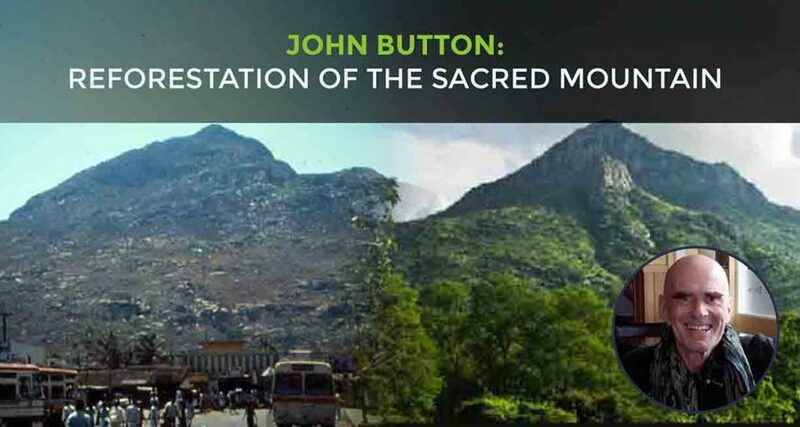 Also, connecting the reforestation of the mountain with the act of worship in the minds of the people. The request for help from the small and radical rainforest action group which I was associated with in Australia, arrived in the form of a very poetic letter which acknowledged that reforesting Arunachala had little to do with the kind of actions which the Rainforest Information Centre usually was involved with, namely because the arid and barren region where the holy mountain stood was far removed from rainforests. However, the letter pointed out, if the forests outside the receding rainforests of India were not enhanced, then there would be little chance of ensuring the survival of those rainforests themselves. I bought my plane ticket. Having done plenty of tree planting but with no experience of involvement in projects beyond my own neighbourhood, I sought all the advice I could find. My original teacher of Permculture and dear friend, Bill Mollison, suggested that if I didn’t have volunteers, then I wouldn’t have a project. His implication was that if no local people believed in the aims of the project enough to offer their services, then it had little chance of success. The other wisdom which comes to mind, was offered by a woman with long experience working with various overseas projects. “Write yourself a letter,” she advised, “about all the things you think you are going to do over there. When you have finished this list, put it in an envelope, seal it up, and put it safely in the luggage you take with you. Don’t open if for at least three months. Even longer would be better. “Do nothing, observe everything” (Masunobu Fukuoka). Inspired by Bill’s advice, I had images of great chains of pilgrims passing seedlings up the mountain, and our forest growing tall and rapidly with the abundance of their enthusiasm. Arunachala 2018. A forested mountain: most people believe it was impossible to do. Mountain has become a rain catcher, where before it was a rain repellent. Springs run again which have not run for many decades; wildlife not seen for years has returned. Huge quantities of wood and wood products without degrading the forest. People have said that they thought it was original forest! I imagined that my presence would be irrelevant after a couple of years. I still recall vividly my first view of the mountain, seen through the window of the bone-shaking bus. We were still twenty kilometers away and the dusty haze blurred any detail beyond the distinctive shape. Drawing closer, my perspective sharpened It was so barren, brown, dry, and almost void of vegetation, much less trees. The work would start from zero. The full significance of the fire manifestation of Shiva came to light. The mountain ablaze was a common sight, deliberately lit to encourage the grasses used for thatching, and to discourage any trees or shrubs that may impede their growth. Not to mention the pyromania inspired by those coming to the mountain to pray for divine intervention to dissolve debt, or deliver a son, or cure a hernia, or an infinite number of other earthly needs. Shiva in his form of Fire was honoured with matches and cigarette lighters. 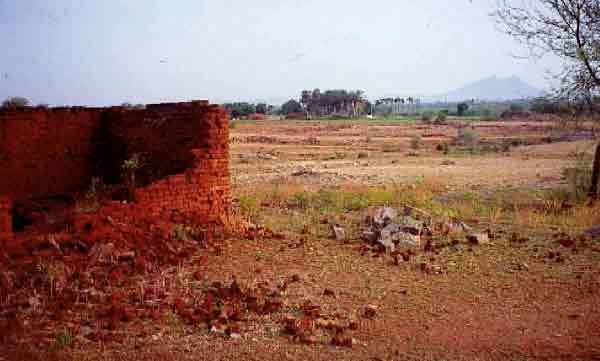 Arunachala was little more than a great mound of rocks. Little fuelwood for the locals, nor medicinal or nutritional herbs, nor any chance of rain from the clouds that chanced to gather, only to be driven off by the dry heat radiated from the scorching sun on the rocky slopes. Even the task of growing any seedlings to plant on the desolate mountain was far from simple. The land for the farm was donated by a person impressed with our work. It was totally degraded, almost without even any grass. In a district where the local population often had to line up for hours at a public tap just to get their most essential household water needs, lavishing water from a private well on plants to raise a nursery was hardly likely to nurture all that enthusiastic support I had dreamed of. “Give yourself up to the mountain, Shiva will prevail” was advice I heard more than once, offered by the spiritual seekers who flocked to the mountain. I was there to work, to get the task done, not to adhere any doctrine or superstition. 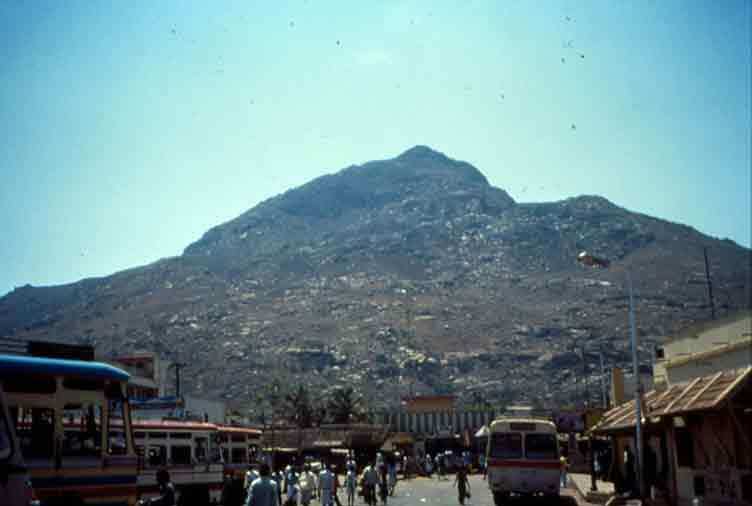 “Arunachala is a Fire mountain, and has always been rocks. 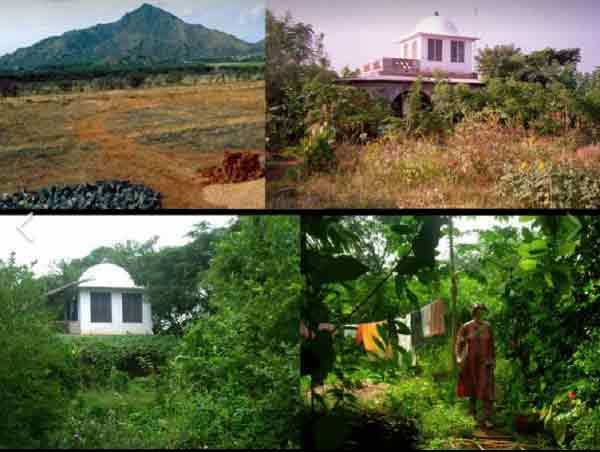 You can’t grow a forest on Arunachala,” other skeptics declared. The local librarian assured me otherwise. Having studied old texts, there were abundant records of great forests on the mountain, which had been renowned as a source of diverse medicines and sanctuary for wild animals. All this though, was negated by photos dating back almost a hundred years which depicted barren slopes with not more vegetation than the present. We raised a nursery nevertheless, watered from an open well in a secluded backstreet. For all it was worth: our first two significant plantings on the mountain were both abject failures. What the flames did not claim, the goats certainly did. “If you have no problems, buy a goat” says one Sufi wisdom. We did not even need to buy our problems. 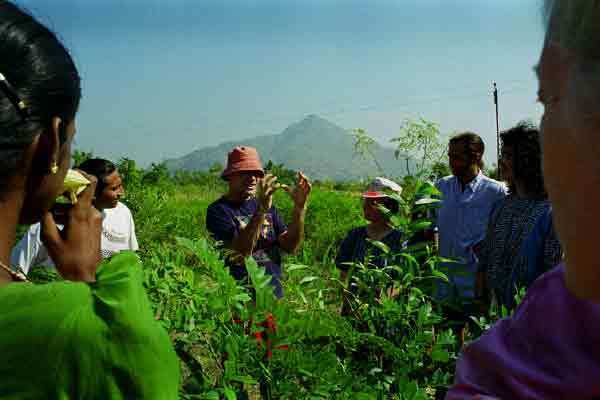 Teaching a course for local farmers on the farm. One of our small team of volunteers inspired a major step forward. He suggested approaching the main temple. Temples are often constructed on springs. Not only this abundance, but the traditional design of the temples consists of many walled compounds focussing inwards to the sanctuary. Further, the temple authorities control 50% of the mountain, and a lot of land around it. They were happy to our proposal to create a nursery while refurbishing the compounds with gardens that had not existed for many years. We selected our plants to supply their needs in flowers and coconuts, as well as planting sacred constellations long neglected. In the following years we raised between 200 and 350 thousand saplings for planting on and around the mountain, and for sale to service the wages our growing workforce. In this case, it was the social edge between the spiritual and earthly life; for the first time local people volunteered their support in significant numbers. Make the least change for the greatest effect. Our next planting was much smaller in area. We selected our planting sites carefully, where the least likelihood of fire casualties lay, where we might zealously guard our vulnerable young ones. Ah, hard-earned success. Our trees grew, planted with the monsoon’s first drops. We had selected well, choosing the hardiest species that would need the least watering, if any. Multiple elements serving every function. After 12 years we had a small herd of cows, harvested all the manure for biogas and liquid fertilizer for recycling to fodder fields, fruit and high value trees, and gardens. Good design is the key to success and productivity. 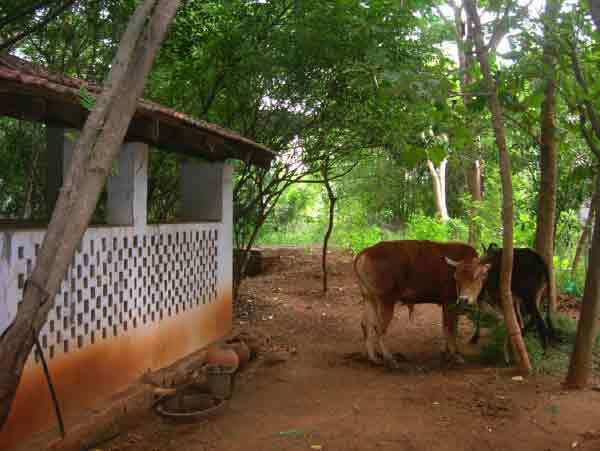 The biogas system next to the cow stall. All urine collected too as fertilizer and for IPM recipes. Gas used for lighting and cooking. Overflow from biogas unit is fertilizer for next fodder cycle, plus for gardens and fruit trees. We planted at least 80 different species – diversity – including shrubs and groundcovers, fast-growing pioneers, climax species. 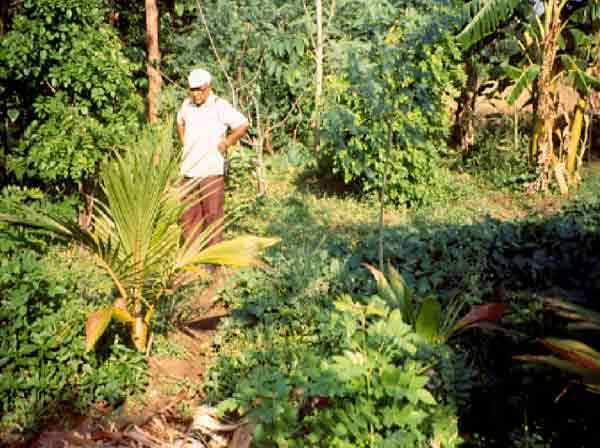 Fruiting species, trees for timber, plants for medicines and other uses. Each element performs multiple functions. Every plant was bunded with a micro-catchment arc to catch and localise water, silt and organic material. I heard some foreign pilgrims complaining that all the trees were spoiling the sunset view from the mountain. Ah, disgruntled whisperings of success! After less than two years, when a fire broke out amongst our plantings, local villagers spontaneously extinguished the fire. They knew the plants would be more value to them than rocks and grass. Real genuine success; the locals were volunteering. Animals and birds not seen for years are now becoming common place. We create nothing; we can only support the conditions for creation to take place. 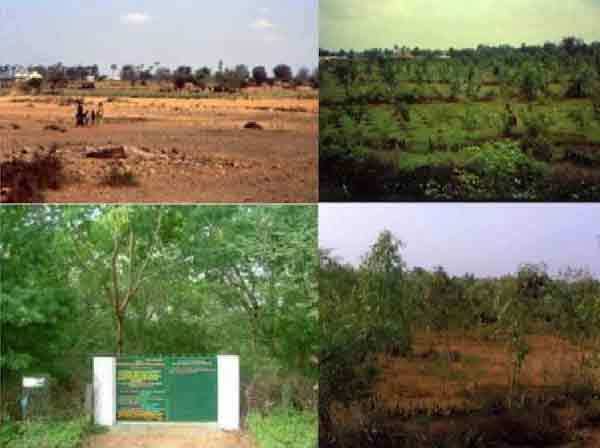 Great bamboo groves not seen for tens of decades are now regenerating rapidly. Huge diversity of species. Fruits, nuts, palm fruits, herbs, etc. A harvest system. Grains, timber, firewood, fruits. The great trees that once covered the mountain are regenerating from their long-ravaged stumps. People can actually harvest the fuelwood from pioneer trees already dying off, and abundant medicinal plants are thriving. It is now more than twenty years since our first small failures – mistakes are tools for learning. It has taken a lot of work, as all projects do at first. Transformation requires energy from somewhere. Many firebreaks have been cut, by the different groups that have grown on the inspiration of the first successes. These days, when the first traces of smoke on the mountain are seen, watchmen with mobile phones quickly alert small armies of school and college students who swarm up the mountain to beat out the fire before it can grow. The skeptics are silent now. The mountain is not yet fully forested by any means. But it will be. The Reforestation process started very well! The biggest limit to abundance is creativity.